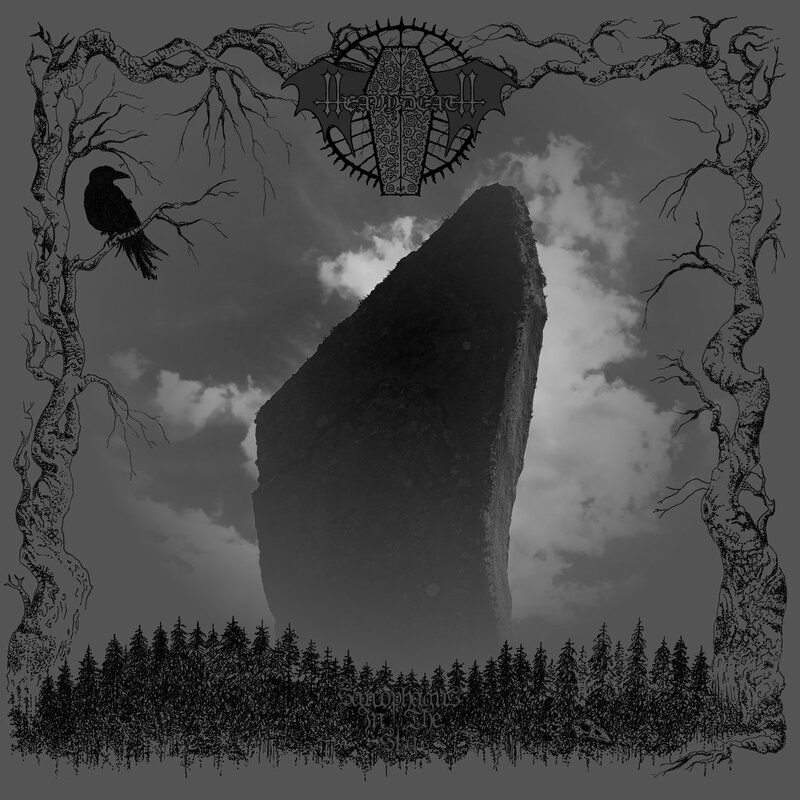 Abysmal Hymns: Heavydeath : "Sarcophagus in the Sky"
Heavydeath : "Sarcophagus in the Sky"
The Swedish doom band who is no stranger to this blog is back. The lines between death metal and doom are much clearer on this album. In fact this would border that where doom and sludge meet more than death metal .The vocals are low and gruff , but not totally growled going into the ten minute opening. It does build into more of a moving rumble, but stays pretty satisfied in its own shadows. "Hunter" has more movement and gets closer in it's throb to sludge. Though there is a very depressing energy to it's melody. The vocals are more of a growl here, though this song is more melodic than the first. The heaviest most death tinged moment comes midway into "Path to the Altitude". This album is very spacious. In a bleak atmospheric manner. It doesn't press down on you with the weight some doom bands might. There are some dissonant black metal like chords in places that provide a nice dynamic touch and give the album varied shades of down trodden gray to chose from. The title track is pretty dark once they get into the meat of the matter. It's the kind of darkness I always speak the virtues of . The kind that proves being dark is just as effect manner of being heavy as the more blunt force methods used by death metal bands. The vocals are lower and do have more menace to their growl on this one. Sung vocals also come in. They are low and kinda gothy. The flange laden guitar tone opens "Autumn of Life" . The vocals have more of a Neurosis like gruffness to them. They churn into a more solid pound of simmering sludge. Not as melancholy or dark as the preceding song. The close the album with "Dawn Without Sun". It has more of a doom like lethargy about it. I'll round this album up to a 9, it doesn't end with what I consider the strongest song , but hits some really awesome moments up until that point, thus the 9, not perfect before moments are stunning. the Faceless : "In Becoming a Ghost "
Death of Lovers : "the Acrobat"
Morrissey : "Low in High School"
Cloak : "To Venomous Depths"
Thantifaxath : "Void Masquerading as Matter"
Morbid Angel : "Kingdoms Disdained"
Converge : "The Dusk In Us"